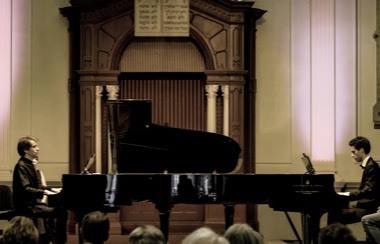 Two master pianists, Severin von Eckardstein and Camiel Boomsma, join hands for an even more impressive programme then the last one they played together. Wagner’s penetrating music comes to life in the Siegfried Idyll and in an arrangement by Camiel of Siegfried’s Rhine Journey. The second half of the concert is dedicated to two Russian grandmasters: Shostakovich and Rachmaninov. In the Concertino the duo prove that Shostakovich was certainly able to write airy and lively music. The music bursts with joy ! 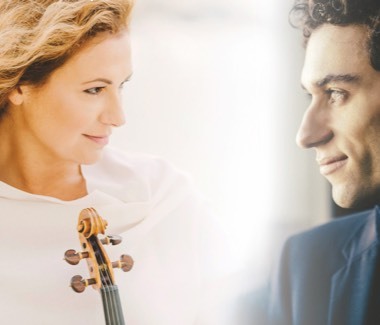 And in Rachmaninov’s romantic Suite opus 5, Boomsma and Von Eckardstein can live it up! When two musical celebrities find each other, it’s no more than logical that their two agents join hands: for seasons 19/20 and 20/21 Gwendolyn Masin’s agent Jurjen Toepoel International Management and I represent this duo for tours and single concerts. For more information about Irish/Dutch/Hungarian violinist Gwendolyn Masin, please contact me. For bookings you can contact either Jurjen or me. 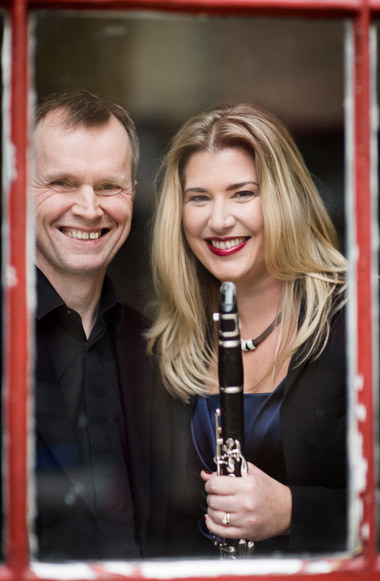 Jean and Steven about the programme: “…The music on this programme draws inspiration from our love of jazz and jazz-influenced music, as well as celebrates two composers who were great champions of both clarinet and piano, Johannes Brahms and Carl Maria von Weber. As a clarinettist, I love playing lyrical music with lines that sing and speak, and this program is full of great melodies. All the pieces on this programme are equally weighted for both players, always being music for clarinet and piano just as much as it is for piano and clarinet. George Gershwin is a composer whose music is deeply ingrained in the American subconsciousness. His beautifully crafted compositions secured a place for jazz and other music from the Americas into the essential American classical repertoire. It is a pleasure to play this arrangement of the Three Preludes for clarinet and piano, especially when we take a peek and see the audience’s feet tapping all together with the music. This (2018) is Bernstein’s 100th birthday year, and the Clarinet Sonata was a young Bernstein’s first published piece. The Sonata follows on nicely from Gershwin with its hints of Copland, Hindemith, and the jazzy sounds of Manhattan. The Sonata by Poulenc was one of the last pieces he wrote. Intended for the “King of Swing” Benny Goodman, the style is in contrast, or even in rebellion to, the impressionistic style of Debussy and Ravel and the other excesses of 19th-century music that Poulenc felt were present in the likes of Wagner. Instead, Poulenc writes clear lines reminiscent of French popular song and jazz found in the Music Hall. Poulenc passed away before he could perform the piece with Goodman, and so it was premiered in Carnegie Hall with Leonard Bernstein on the piano in 1963. The Brahms Sonata No 2, Op 120 in E flat is one of the pieces that established us as a duo several years ago. The Opus 120 Sonatas are Brahms’ very last works and are the output of an inspired, fully-formed, master composer. The Sonata in E flat is full of friendliness, intimacy, lyricism, and conversation, and it delights in the sonority and capability of the modern piano.